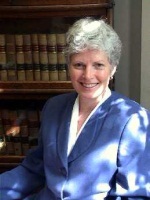 Judge Susan Tate is a native of Monroe, Georgia and a graduate of the University of Georgia, where she earned B.A. and J.D. degrees. Judge Tate served as Assistant Regional Counsel and then Deputy Regional Counsel for the U.S. Department of Energy in Atlanta, where she was also the liaison with the Department of Justice, then practiced law in Athens for fourteen years prior to taking office as Probate Judge of Athens-Clarke County in January of 1997. She was the first woman President of the Western Circuit Bar Association. She is a former President of the Council of Probate Court Judges of Georgia and was voted Outstanding Probate Judge of the Year in 2005. She has served on numerous committees and commissions of the Supreme Court of Georgia, the Judicial Council of Georgia, and the State Bar of Georgia. Currently, Judge Tate serves on the State Bar’s Access to Justice Committee and chairs the Weapons Carry License Committee of the Council of Probate Court Judges of Georgia. She also created and chaired the Mental Health Committee until she stepped aside for new leadership. Judge Tate maintains her dedication to mental health issues through her involvement in Treatment and Accountability Court, attending mental health forums sponsored by The Carter Center, and conducting mental health training for judges, attorneys and mental health professionals throughout Georgia.